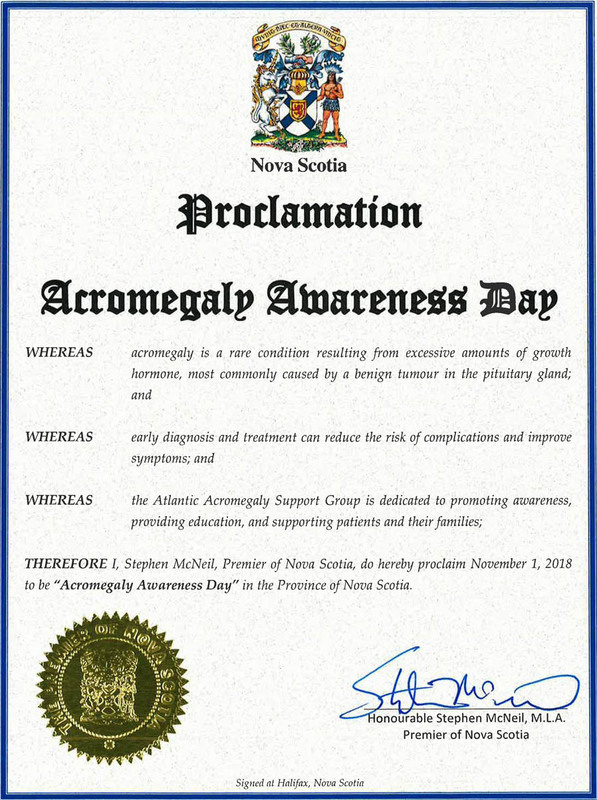 We are a support group for those who have been diagnosed with Acromegaly within the Atlantic Canada region. We have meetings twice yearly and of the over 70 people who have been diagnosed with Acromegaly within the Atlantic Provinces, nearly 25 participate and attend our sessions. Our goal at our meetings is to have a guest speaker who will speak about the conditions and treatments available to us in the different fields that we need to be seen for the clinics (e.g. Endocrinology, neurology, radiology etc.). We have had some GREAT presenters so far. Acromegaly is a hormonal disorder that results from too much growth hormone (GH) in the body. GH Comes from a benign, or noncancerous tumor on the pituitary. If you have these symptoms please see your Family Doctor and ask for a GH and IGF-1 blood test.